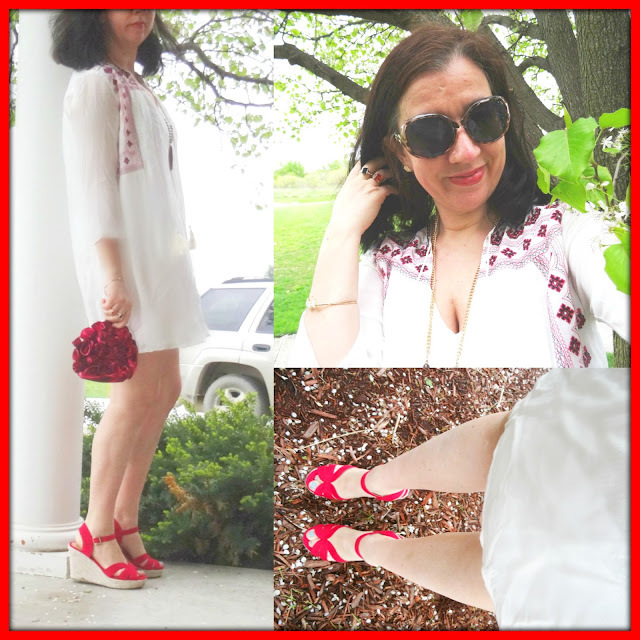 The Perfect Cinco de Mayo Outfit + Thursday Moda Linkup. Happy May you all - yeay, my birthday month is here! I totally meant to post yesterday since it was May 1st but you know Mondays - they are always super busy - and yes somehow I blinked and my Monday was gone! But I love how this month started on a Monday which is the first day of the week so I say a great start to a great month! Anyhow yesterday was cold, drizzly and weird weather all day. But I finally shot this outfit today because let me tell you, this is the Perfect Cinco de Mayo Outfit. 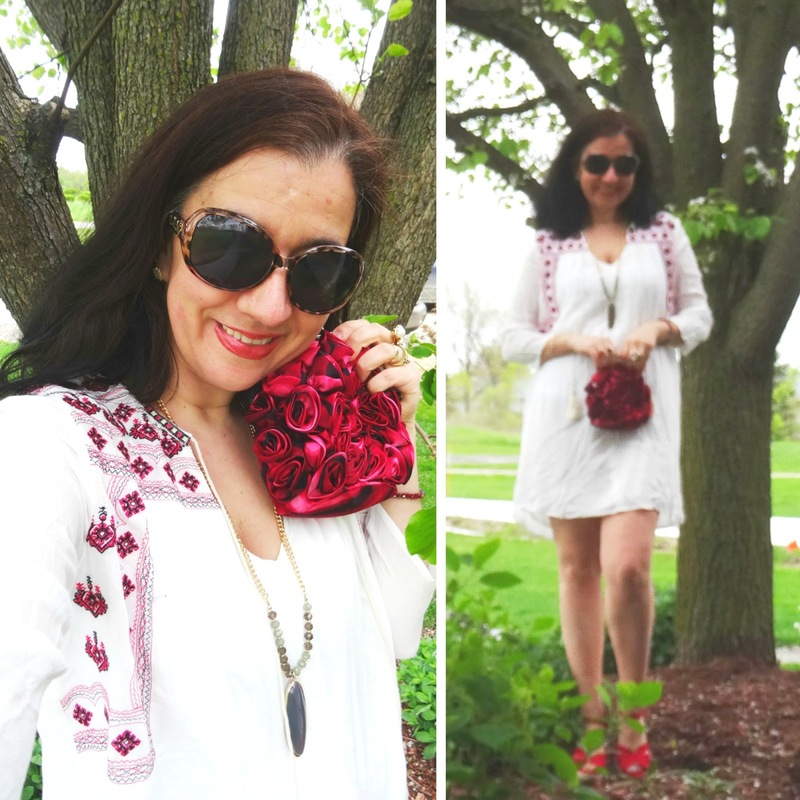 April Showers (and we had a lot of those in April) bring May Flowers and pretty florals or flower embroideries, like on my pretty LWD c/o a local Ann Arbor (Michigan boutique). They have the prettiest Bohemian pieces - like my dress. They were kind enough to gift me a tunic, a necklace, a bracelet and a pair of hoops too. This dress arrived last week and it was perfect for me not only because I am a dresses' girl as you all know but come on, it is a girly flowy Bohemian style and has pretty embroidered flower motifs in red - which is my most favorite color of all. I really wanted to wear it and style it last weekend and have it posted on the blog yesterday as I immediately thought of Cinco de Mayo once I opened the package, (this dress hadn't arrived at the boutique yet when I received it). But cold weather and rain don't mesh well with white dresses, especially ones that are made in light gauze material like this. And to tell you the truth, it was cold and in the 40s today too, when I shot these photos. But weather be damned - I am a style blogger and I sacrifice for fashion. I wanted to show you all how I would style this LWD for May 5th or you know a day of Mexican Fiesta - burritos, fajitas and margaritas. I am a sucker for red first of all and to me Cinco de Mayo ultimately requires some red. Mexico has red as one of their country's colors, too. It was easy to pair this dress with red since the embroidery is all in red. I added my Red Wedges (purchased last Summer at Payless - yet first time you see them on the blog, sorry), and an 'old' Red Rosette Clutch which is the prettiest, girliest clutch I own and a Pave+Pearl Flower Cocktail Ring (both of these pieces from about 6 years ago). I also added a Long Necklace w/ tiny neutral-tone crystals but in the middle there is this grayish-olive big oval stone, it paralleled the tasseled laces of my dress. I decided against red lipstick though and chose a Shimmery Rust Orange Lipgloss instead. I cannot wait to style this dress with sneakers next and very simple jewelry. And I sometimes plan on styling with heels and turquoise jewelry, too. White Bohemian Gauze Dress w/ Embroidered Floral Motif: c/o Eclair (New) (similar sleeveless sheath, love this), (flowy feminine option, my Favorite), (similar off-shoulder option, Small Splurge, love this), (similar off-shoulder option). Red, Rose-Patterned Silk Pouch Clutch w/ 3D Roses: White House Black Market (similar in black, love this), (similar), (similar, huge Splurge). Geometric Ivory "Tessa" Iridescent Druzy Studs: Kendra Scott via Rocksbox (New) (identical + I love them! ), (almost identical), (similar, Great Deal, love these), (similar, Small Splurge, my Favorite). Long Chain Necklace w/ Earth-Tone Beads & Large Oval Gray-Olive Stone in the middle: Target (New) (quite similar, Great Deal, love this), (similar dainty option). Gold Tone, Mother of Pearl Pave Triangle Cuff: Slate via Rocksbox (New) (similar, Huge Steal, my Favorite), (similar, Great Deal), (similar wide cuff, Small Splurge, love this). Gold-Tone Pearl & Fireball Pave Cocktail Flower Ring: Banana Republic (similar, Huge Steal), (similar, Steal, love this), (similar, Splurge, my Favorite). Orange Rust Shimmery Lipgloss: Wet N' Wild (similar, Steal, love this), (similar, Splurge, my Favorite). Brown+Black Tortoise Sunglasses: c/o a Boutique in Albania (similar, Huge Steal), (similar, Fantastic Deal, my Favorite), (similar, Splurge, love these). Red Faux Suede Wedge Sandals: Payless (similar, on Huge Sale), (similar mule style, Great Deal, love these), (similar closed toe option, Great Deal, my Favorite), (similar, Small Splurge, love these).